"Swinging with THE RAT PACK!" When Frank Sinatra, Dean Martin and Sammy Davis Jr. hit the stage, it was always a "swingin affair"! These enormously talented entertainers, known as "The Rat Pack", were the coolest cats to ever play Las Vegas…. or anywhere for that matter! 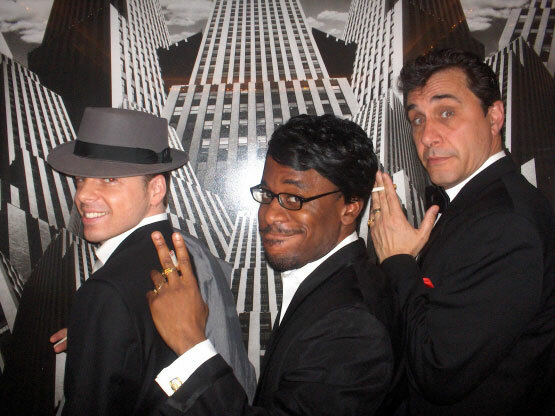 Now, three skilled New York actors are bringing the songs, the laughs and the charisma of Frank, Dean and Sammy back to life in "Swinging with THE RAT PACK!" This trio of professionals is highly skilled in improvisation and live interactive performance. When they perform, they not only capture the look and sound of Frank, Dean and Sammy, but their irresistible charm and chemistry as well! Just like the original Rat Pack, the show is completely spontaneous and full of ad-libs…making it a must see...over and over again!! "Luck be a Lady", "That's Amore", "The Lady is a Tramp" and "Candy Man" are just some of the timeless classics you'll enjoy during the show along with a whole lotta ring-a-ding-ding!!! "Swinging with THE RAT PACK!" is a fun-filled 90 minute musical celebration that re-creates the magic of The Rat Pack, with a very special guest appearance from Marilyn Monroe, and is as close as you can get to hanging out in the front row at the Copa!! "Swinging with THE RAT PACK!" 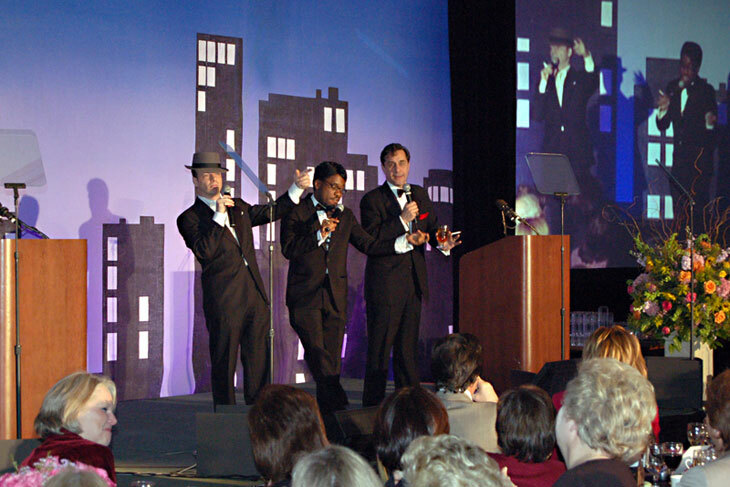 has performed at various corporate events and private affairs throughout the country. This show has thrilled audiences in casinos in Atlantic City, BB King's in Times Square and the Empire Casino at Yonkers Raceway. The Pack also flew to Dubai in the Middle East for a very special private performance which was a real "gasser"! and Louis Armstrong — in one song. His jokes about mopping the floor and asking if any of “his people” were in the room were a little uncomfortable, but that’s time travel for you. It’s exactly what Sammy kidded about, back when. The whole audience sang along to “That’s Amore,” and I’ll admit, I was moved to sing along at top volume. Marilyn crashed the party and sang a breathy, glamorous “Diamonds are a Girl’s Best Friend,” and then, “You Gotta Choose Me” with the boys. She sang another solo — “My Heart Belongs to Daddy,” after which she said, “Hello, Daddy!” to a fellow in the audience named Charlie, who she dragged on stage and sang, “I Want to be Loved By You” to while groping the poor guy. It might have been the funniest part of the show. Frank and Dino went back and forth with the fi rst lines of one of their own songs, goofi ng on the second line — “Return to me... I’ve got a sink full of dirty dishes,” sang Dean. Then, to end, a killer version of “Mack the Knife” and “New York, New York,” complete with audience members kicking in a chorus line. your next party, corporate event or special occasion by hiring this Sinatra Impersonator for your event! Jesse Posa is one of the leading Frank Sinatra impersonators in the New York /New Jersey area and has been a big hit with audiences of all ages. Jesse Posa performs as Frank Sinatra in the ultimate performance featuring the Chairman of the Board’s biggest hits. Summer Wind, Strangers in the Night, I've Got The World On A String, Fly Me to the Moon, My Way and much, much more!